Before I discovered light therapy, winters were terrible for me. I don’t just mean I got a little sad and missed the sunshine, I mean I became barely functional. Last winter, for the third winter in a row, I had to take time off my job because I just couldn’t get it together enough to show up at work every day. Before I discovered light therapy, I spent most winter days in bed. When I did wake up, I gorged on unhealthy foods, loads of carbs and the extra pounds started to stick to me. I didn’t want to talk to my family, and I didn’t want to see my friends. This went on for several years before one doctor finally took the time to really delve into my background and spotted the pattern. 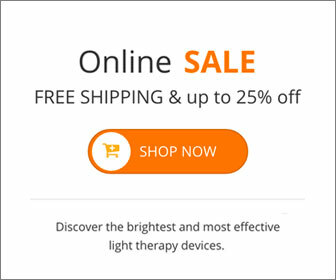 I was diagnosed with Seasonal Affective Disorder (SAD) and told I should try light therapy. I bought the NorthStar 10,000™ light box from Alaska Northern Lights and started my therapy the day it arrived. I like to use light therapy first thing in the morning. I sit near the light, drinking my morning tea, and just enjoy that peaceful 30 minutes alone with my thoughts…in the light. It started to work for me almost instantly. Within a few days, I noticed I had increased energy. I started to sleep better at night and stay awake during the day. I started to focus on what I was eating and trying to be healthy again. After a week, I went back to work. I started socializing with my family and friends again. For me, the light therapy was a miracle. Light therapy ended years of trying to figure out what was wrong with me in the winter time. It gives me a reprieve from the depression symptoms I had felt, all winter long, for many years. With light therapy, I no longer dread the seasonal changes. It makes my life livable again. This entry was posted on Monday, March 3rd, 2014 at 7:37 am	and is filed under Light Therapy. You can follow any responses to this entry through the RSS 2.0 feed.